SkyWest Flight Attendant Praised as "A God Send"
SkyWest’s success is a direct result of the incredible aviation professionals who who regularly go above and beyond to help passengers on more than 1,700 daily flights. Recently, Mary Morgan, a Seattle-based flight attendant was commended for being “a God send…at a most difficult time” thanks to the kindness and support she provided on a flight from Ontario, California to Seattle. 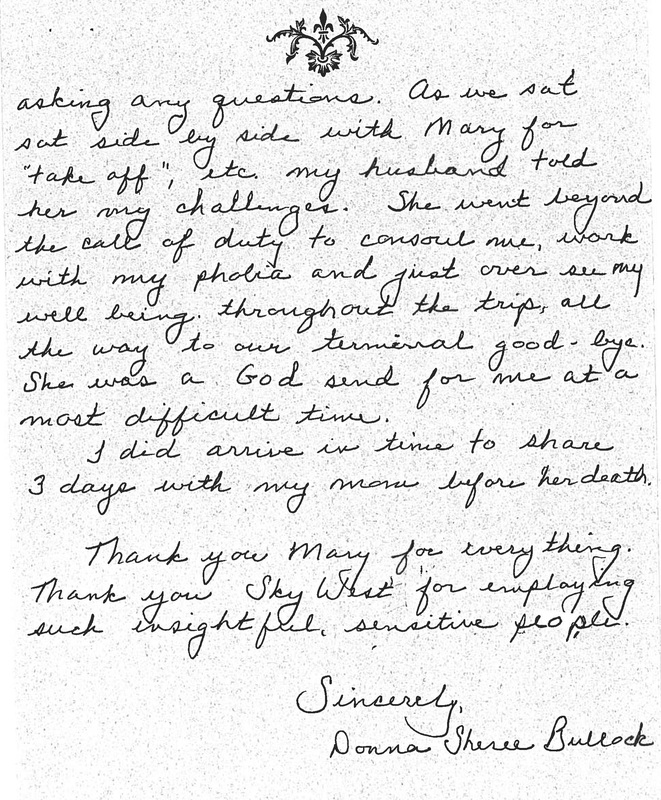 I am writing to acknowledge a flight attendant who truly “got me home” on a most difficult flight. Mary, her name, Flight 3447 Friday May 8th, Ontario to Seattle. 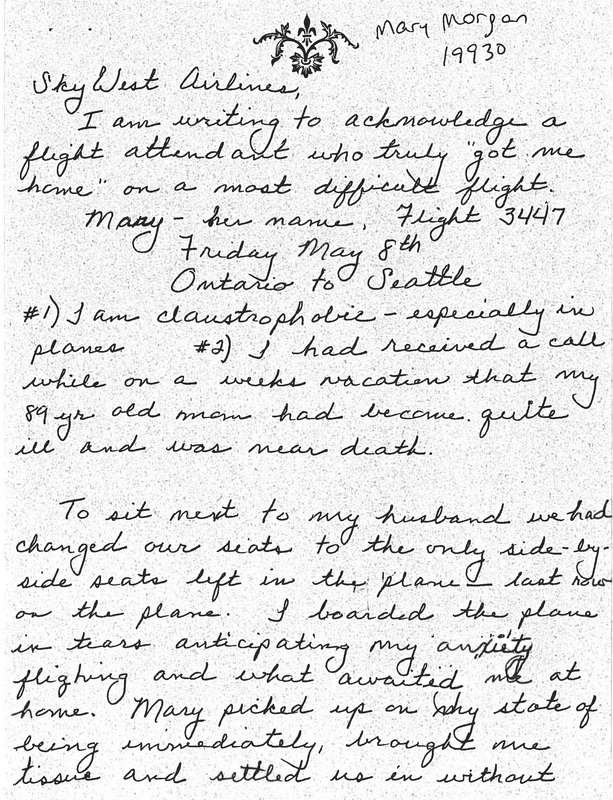 #1) I am claustrophobic – especially in planes #2) I had received a call while on a weeks vacation that my 89 yr old mom had become quite ill and was near death. To sit next to my husband we had changed our seats to the only side-by-side seats left in the plane – last row on the plane. I boarded the plane in tears anticipating my anxiety flying and what awaited me at home. Mary picked up on my state of being immediately, brought me tissue and settled us in without asking any questions. As we sat side by side with Mary for “take off,” etc. my husband told her my challenges. She went beyond the call of duty to console me, work with my phobia and just over see my well being throughout the trip, all the way to our terminal good-bye. She was a God send for me at a most difficult time. I did arrive in time to share three days with my mom before her death. Thank you Mary for everything. Thank you SkyWest for employing such insightful, sensitive people. This letter is just one of the many compliments SkyWest’s 10,000+ employees receive each week thanks to their efforts to ensure every passenger enjoys a great travel experience.